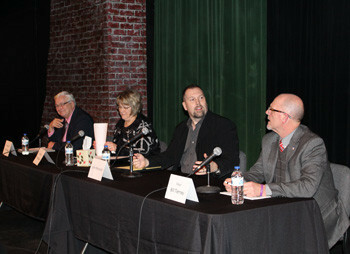 The Portage Area Chamber of Commerce hosted a mayoral forum on Feb. 10. Thank you to the candidates for participating, Portage Center for the Arts for providing a great stage, the Portage Daily Register’s Kerry Lechner for serving as moderator, and the Register’s Lyn Jerde for covering the event. Below is her article that appeared in the Feb. 11 edition of the Portage Daily Register followed by another feature appearing in the Feb. 12 edition. Four candidates for Portage mayor on Wednesday presented four different visions for the city’s future. After Tuesday’s primary election, the field will be narrowed to two candidates. About 60 people came to the Portage Center for the Arts to compare all four candidates side by side. Businessman John Morauski repeatedly used the phrase “casting a vision,” and contended that the city’s future prosperity depends on its leaders allowing a big-picture goal to guide all decisions. Third District Alderman Rick Dodd said his vision entails having all segments of the community working together. “If all groups pull their own way, we will never get the city forward,” he said. Ninth District Alderwoman Rita Maass said economic development, including new retail stores, is key to the city’s future. “We need to make Portage a proud place for future generations — a place where they’re proud to live, work and call their stomping grounds,” she said. In outlining his vision for Portage, Mayor Bill Tierney, who’s seeking his second consecutive three-year term, first noted what had happened since he took office in 2013, including the hiring of a city staff member for economic development and improvements at Goodyear Park, such as the splash pad, a new shelter and the soon-to-open skate park. Using questions that had been submitted in advance by Portage residents, moderator Kerry Lechner, editor of the Daily Register, asked each candidate to talk about topics such as economic development, the future of the Portage Canal, truck traffic in the downtown area, sidewalks and signs. In one way or another, economic development played a role in most of the issues that the candidates addressed. Dodd said the city is in “a little bit of dire straits” due to its nearly-dwindled borrowing capacity and struggling tax base. But economic development, including more jobs and more businesses, would go a long way to addressing those challenges, he said. Maass said she thinks some of the money that the city is spending on infrastructure projects should be targeted instead to economic development, including the attraction of more retail and “niche” businesses. Tierney said some of the city’s infrastructure is more than a century old, and infrastructure is vital to Portage’s long-term well-being. Morauski said small projects, in the absence of a larger vision, won’t result in a better economic future for Portage. From sidewalks to signs, the four people who want to be Portage’s next mayor offered varying viewpoints at a forum held Wednesday at the Portage Center for the Arts. Bill Tierney, who is seeking his second consecutive term, said he welcomed his opponents — alders Rick Dodd and Rita Maass and businessman John Morauski — to an election that is crowded enough to trigger a primary on Tuesday to narrow the field to two for the April 5 non-partisan election. Choice is good for the people of Portage, Tierney said, as is the presence on the ballot of at least one candidate for each of three aldermanic districts that are open for election April 5. The full slates on the ballot, and an audience of about 60 people at the PCA for Wednesday’s forum, both indicate that Portage’s citizens take an interest in their municipal government, Tierney noted. It was citizens who suggested the questions that the candidates addressed Wednesday. How would you fill Portage’s vacant business and industry buildings, and bring new business to Portage? Morauski said attracting new business to Portage requires taking an attitude of a servant instead of a manager — being willing to help, not dictating rules. “We have empty buildings because we’re not inviting,” he said. Tierney said that, in many cases, Portage does not fit the demographic criteria for which particular businesses are looking. By the same token, he said, some business owners conclude, after a short time in Portage, that this is not the community for them. Ensuring that prospective entrepreneurs have a sound business plan — particularly before they receive aid from the city — is the key, Tierney said. “What we don’t want are the ones that are here for a few months and gone, because they don’t have the business plan to be successful,” he said. Dodd said there are, in fact, business owners who are actively pursuing location in Portage, but at this stage of negotiations, he is not at liberty to offer specific information. But, while he would like to see more vitalization in the downtown area, Dodd acknowledged that the retail industry has changed. Furthermore, Dodd said, one reason that large local retail businesses are no longer in downtown Portage is because Portage residents chose not to shop locally. Maass spoke of the need to market Portage aggressively. “We need to work diligently to get something else here,” she said, suggesting that small niche retailers might be the best hope for boosting Portage’s retail offerings. Another strategy, according to Maass, would be to look closely at Portage’s near-misses in efforts to land businesses — the times when the city was one of the business owners’ top choices, but the business ultimately went elsewhere. Do you think every Portage street should have a sidewalk? Should River Street? “Do we need sidewalks in some areas? We do,” declared Maass. However, if installing sidewalks requires putting them too close to homes, the need should be closely evaluated. “I really feel that the citizens are speaking here, and we need to step back and look,” she said. Morauski said, “I don’t think imposing sidewalks on people is the right choice.” The city needs a big-picture plan, he said, and use that plan as a basis for deciding whether a sidewalk should go in a certain area. Tierney said a long-standing city plan includes, as one of its top priorities, ensuring that sidewalks are connected to each other as much as possible, with minimal gaps. “I want every citizen, from newborn to the day they die, to be able to walk in Portage safely,” Tierney said. Dodd said he, too, supports sidewalks in general, but in some older areas, putting them in would leave a setback from the houses of only 10 to 15 feet. “We need to be smart in how we put sidewalks in,” he said. Do you support the city’s sign ordinance? Tierney said it became apparent that the ordinance needed overhauling when several people asked for, and got, variances to the ordinance’s requirements from the city’s Board of Zoning Appeal. A sign ordinance, Tierney said, needs to take into account modern technology, as well as balance the sign owner’s freedom of expression with the city’s need for sign standards. Dodd agreed that a sign ordinance is needed, and it needs to be a lot simpler and shorter than the ordinance the city has now. “It needs to take into account all the signs in Portage, and it’s less than 10 pages long,” he said. Maass said that, while a sign ordinance is needed, some of the people with non-conforming signs might be small businesses, for whom compliance might be prohibitively costly. Maybe that problem can be addressed by “grandfathering” in existing signs that do not conform to a new ordinance. “I think it’s asking a lot of small businesses to suddenly come up with a new sign,” she said. How would you address Portage’s decrease in home ownership and increase in home rental, and related issues such as absentee landlords and decaying buildings? Dodd said the city has a right to enforce standards for buildings’ exterior appearance, and the Portage PRIDE effort can help motivate such improvements. Maass said the city’s ordinances must be enforced, including zoning ordinances that specify that an area is zoned for single-family dwellings. Morauski said it’s a “tax issue,” because assessors inspect the inside of homes to help establish valuation, and people will hesitate to make interior improvements if they know it will mean a higher property tax bill. Tierney said the city has access to financial help for fixing up deteriorating property, from sources such as Community Development Block Grants. But the reality of modern housing, Tierney said, is that many young adults prefer renting to buying a home, because they like the flexibility of being able to move quickly when they need to. What should happen to the Portage Canal? Morauski said people with “waterfront property” near the canal could do much to clean up the area around it. Tierney noted that the city has contracted with a firm that is working on designs for revitalizing the canal, and is also working with the Wisconsin Department of Natural Resources. However, he said, he’s disappointed that more progress on the canal hasn’t been made in his three years as mayor. Dodd said the city isn’t ready to spend money on canal revitalization because there is not yet a clear vision of what that revitalization would entail. “Cleaning up the canal without cleaning up the site around it is not going to help us,” he said. In the short term, Maass said, she would favor enlisting the assistance of city crews to clean up the area along the canal from the railroad bridge to the Historic Indian Agency House. What should be done about truck traffic in downtown Portage? Morauski noted that he attended Monday’s public information meeting, hosted by the Wisconsin Department of Transportation, pertaining to the study of Highway 33 from Baraboo to east of Portage. Although DOT officials made it clear that a bypass is not in the cards, he said, perhaps a truck route could be used to divert trucks from downtown. Tierney said businesspeople in downtown Portage are of a divided mind on truck traffic. Some don’t like the noise and congestion that trucks bring, he said, while others appreciate how truck traffic slows down other traffic, so that passers-by can see their stores. Dodd pointed out the topographic challenges of steering truck traffic away from downtown. Maass said that diverting trucks from downtown might have unintended consequences. Portage city government experience: First elected as alderman at age 19, on and off Common Council since then; mayor, 1999-2000 and 2013 to present. Occupation: Self-employed, owner of Above Average LLC. Number of children and grandchildren: Four children. Number of years of residency in city of Portage: Eight total.